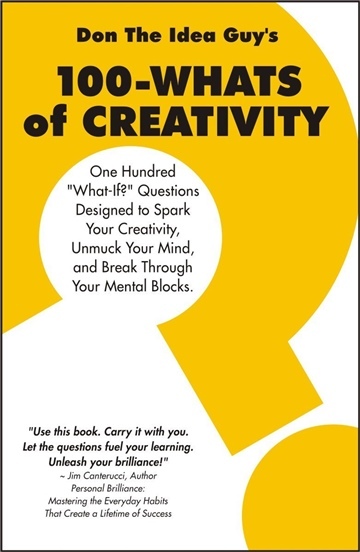 Filled with questions that are calculated to whack your thinking in weird, fresh and unusual directions -- and help you to power your way through the creative blocks that may be stifling your thinking. Each page is devoted to a single "What if" question, along with several paragraphs of ancillary what-ifs to help you to apply it to your creative challenge. What if... it made noise? What if... it was a candy bar? What if... it had an attitude? What if... your idea had a theme song? These questions are aimed at helping you to clearly visualize the nature, aspects and elements of your creative challenge -- its "personality," if you will. This is the first step toward generating ideas about the subject. What-Ifs are interspersed with short quotes from Don The Idea Guy which are designed to encourage you on your creative thinking journey. Possessing creative powers beyond those of mere mortals, DON THE IDEA GUY rescues those in need of innovative ideas through his brainstorming sessions, articles, and websites. Don is the author of the book “100-WHATS of CREATIVITY”, one-hundred ‘what if?’ questions to spur your creativity, unmuck your mind, and break through your mental blocks and has written dozens articles and hundreds of blog postings on the subject of increasing innovation and adding creativity to your personal and professional life. DTIG is an award-winning public speaker and an official “Trained Brain” of the Eureka Ranch in Cincinnati, Ohio. He has sold, shared, or traded ideas with the likes Sears-Kenmore, Ford Motor Company, Palm, American Airlines, Coca-Cola, Kelloggs, The American Marketing Association, Doug Hall, Seth Godin, Daniel Pink, Jeffrey Gitomer, and The Tom Peters Company. 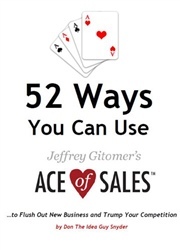 The Idea Guy is a Gitomer Certified Speaker, hand selected and entrusted by best selling author and sales expert Jeffrey Gitomer to deliver his content with clarity, humor, and impact. Don was also awarded status as a Gitomer Certified Advisor, authorized and mentored by the global sales guru to sell and facilitate Gitomer’s full-day classroom courses on sales training, attitude, networking, and customer loyalty — as well as sell the exclusive web-based training platform GitomerVT. Everyone wants more of them, but they're not that easy to come by. Unless... you know how to train yourself, and think, about how to come up with them. That's what this book does. Stuck? Need inspiration? This book will get your brain moving to a place where you can come up with new and exciting ideas that can boost your brand or business. 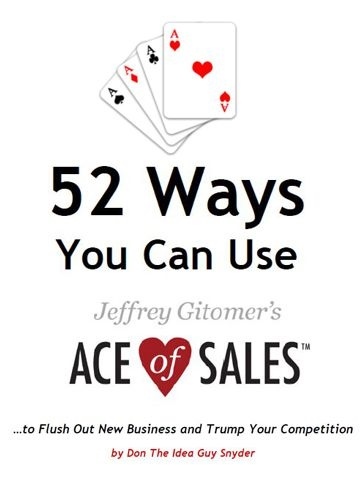 Buy this book for a quick and easy, and fun read, then be amazed at the ideas you come up with during, and after. Don "The Idea Guy" provides a solid base of questions to get you moving on your idea. You can use these questions all day, every day and apply them to many different types of problems and opportunities. I'll treat this book as a reference, keeping it by my side as I seek to innovate. I had no idea what to expect when I came across this book. All I knew is I needed a dose of fresh. And this delivered more fresh than mountain air.If you're stuck in a rut or challenged by a scenario and want to double down and impress those around you with your incredible ability to think outside the box, this is a manual for life that should never leave your side. Impressive stuff! When I bought this book I was feeling very Stale to be honest. It simply took a couple of pages of this book to get the creative juices flowing again. This book can be applied to any career or situation for that matter. It shows you how to open your mind to any out come from any situation. I think the Idea Guy truley is the Van Gogh of open ended questioning.